Fall is a spectacular time to visit Algonquin Park. Thousands of visitors from around the world are attracted by the outstanding fall colour viewing opportunities, but there are many things to see and do. When Do the Leaves Change Colour? The fall colours alone make a trip to Algonquin Park worthwhile, especially if you catch the spectacular colours from mid-September to mid-October. While hard to determine the exact peak of the Sugar Maple and Red Maple fall colour, it is typically the last week of September or the first week of October. Shortly after, the poplars (aspens), Tamaracks, and Red Oaks hit their best and put on another interesting show before giving way to a more subdued November. The best fall colour in Algonquin Park is variable and depends on a number of factors including tree species, daylight length, temperature, moisture, etc. Check the current fall foliage reports for the latest information and predictions concerning this season's fall colour change. Everyone who uses a provincial park must have a valid Park Permit. Day use visitors may purchase permits at major park facilities such as the West Gate, East Gate, Visitor Centre, Logging Museum, Sand Lake Gate and Access Point Offices. Picnicking is a popular recreational activity during the fall months. With a valid permit you may visit a picnic ground or day use area along the Highway 60 Corridor. Help protect Algonquin Park and our wildlife, including Black Bears, by minimizing your waste by using the Park's multi-stream waste management system. Weather in Algonquin Park during the fall months can vary from summer-like conditions to early snow flurries. Come prepared by planning ahead and check the local weather forecast. Please note that the fishing season for Brook Trout and Lake Trout concludes in Algonquin Park at the end of September. Ensure your are complying with fishing regulations by learning more about fishing in Algonquin Park. Several developed campgrounds, accessible by vehicle, close in early September but most remain open until Canadian Thanksgiving (second Monday in October). The Mew Lake Campground is the Park's only year-round developed campground suitable for late fall or winter camping opportunities. Algonquin Park's backcountry is open year-round. All backcountry Access Point Offices operate to Canadian Thanksgiving (second Monday in October). For information about obtaining backcountry permits after Canadian Thanksgiving (and during the winter months) contact the Park Information Office. Algonquin Park's two museums, the Visitor Centre and Logging Museum, are open daily until the end of October (see the Events Calendar for specific operating dates and hours) offering all visitors park information, permits, plus outstanding natural and cultural history exhibits and programs. Organized groups, such as schools, youth groups and organized bus tours, may wish to hire a naturalist guide through the Group Education Program. 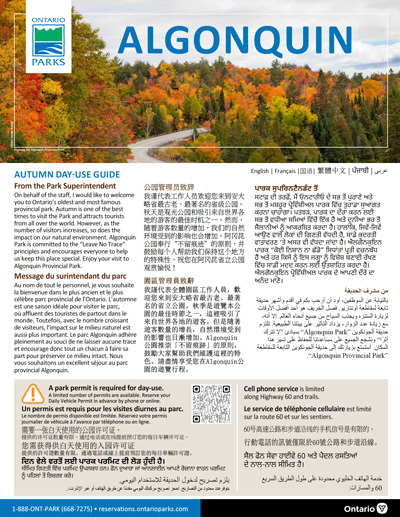 Individuals visiting the park may be interested in participating in unique learning opportunities through the Experience Algonquin Workshop series. Numerous businesses, both inside and outside Algonquin Park, provide products and services for your next visit to the Park. This includes accommodation, restaurants, outfitters, retail outlets, etc. Check the Commercial Services section for more details. Algonquin Park's three lodges (Arowhon Pines, Bartlett and Killarney Lodges) are usually open until Canadian Thanksgiving (second Monday in October) offering fine dining and/or accommodation. Please contact each lodge (see above) for exact operating dates, rates, meal times, and availability. The Opeongo Store, The Portage Store, and the Two Rivers Store are all open to Canadian Thanksgiving (second Monday in October). The Sunday Creek Café, located in the Visitor Centre, is open until the end of October. Dining is available also at the three lodges found in the Park, however, reservations are recommended. A wide selection of restaurants can be found in all areas surrounding Algonquin Park. Check the Commercial Services section for more details. Limited groceries are available at the Two Rivers Store and the Opeongo Store along the Highway 60 Corridor – both are open to Canadian Thanksgiving. Gasoline is available at The Portage Store and the Opeongo Store along the Highway 60 Corridor – both are open to Canadian Thanksgiving. After Thanksgiving to mid-May (i.e., during the late fall and winter), gasoline, groceries, and lodging are available only outside the Park. All interpretive walking trails are open during the fall months offering spectacular views of the autumn colours. Walking trails along Highway 60 with lookouts are most popular during the fall months. Trail guide booklets are removed from trailhead dispensers from late October to early May. Booklets are available year-round during business hours at the East Gate, West Gate, Visitor Centre and online. Bike trails remain open for the early fall months or until conditions such as heavy snow makes bicycling unfeasible. See the particular trail for more details. During fall, you'll have a good chance of seeing a big bull Moose, its antlers now full-grown and polished, ready for the rut (mating season), in late September and early October. Fall evenings are the best time to try howling for wolves. Experience fall bird migration by participating in an Interpretive Program or booking your own guide through the Group Education Program. In fall, days are shorter and weather conditions may change quickly as winter approaches. Check the weather forecast before setting out on your adventure in Algonquin. Allow enough time to be off trails and back at your vehicle before dusk. Wear appropriate footwear, and wear clothing appropriate for the time of year. Cell phone coverage in Algonquin Park may be "limited" or "none". See the Events Calendar for a complete listing of upcoming programs, special events and operating hours for major Park facilities.